can trace its history back five hundred years. It was first minted under the reign of King Henry VII. Minting of the coin was suspended in 1603 but commenced again with King George III in 1817. 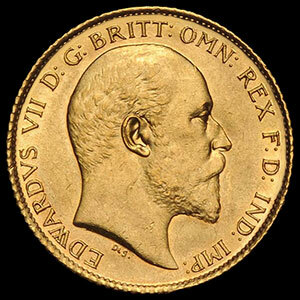 The obverse of British Sovereigns features the bust of the reigning monarch at the time it is minted. 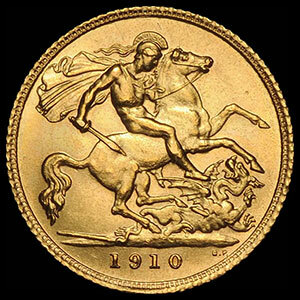 The reverse side depicts a famous representation of St. George on horseback slaying a mythical dragon. The date and mint mark appear beneath St. George. Each coin contains 0.2354 troy ounces. The composition of the coin is 9l.67% gold and 8.33% other alloys. Dates offered are from 1902 – 2006; minted in various mints throughout the former British Empire.